comic books. The most popular genre was the one Superman had founded, the superheroes, and the long-underwear guys were getting lost in the crowd. And one of the crowds it was particularly easy for them to get lost in was MLJ Comics, which churned them out prolifically in the early 1940s. Most were fairly short-lived, and all were crammed into a mere four monthly titles. 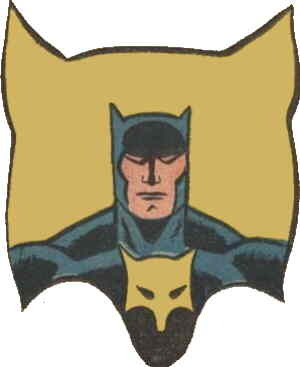 The Fox debuted in MLJ's Blue Ribbon Comics #4 (June, 1940). He was news photographer Paul Patton, who designed a camera that could be attached to his belt, so he wouldn't drop it and miss shots. He became a costumed crime fighter mainly to further his career with good crime photos, a schtick similar to one that Spider-Man used in the '60s. There was only one other regular cast member, Ruth Ransom, who was both his girlfriend and his editor. The origin story was written by Joe Blair (one of MLJ's regular writers, who also co-created Zambini the Miracle Man, Madam Satan and many other characters with equivalent name recognition) and drawn by Irwin Hasen (best known for Dondi, tho most of his '40s work was done at DC on such characters as Wildcat and Green Lantern). Paul and his black-clad alter ego continued to appear in the back pages for the rest of Blue Ribbon's brief run, which ended with its 22nd issue (March, 1942). He appeared only once on the cover (#16, which showed all the title's regulars), the majority of which featured a Spectre knock-off called Mr. Justice, nor did he appear in any of MLJ's other early titles. Toward the mid-'40s, the company dropped its superheroes and switched almost entirely to teenage humor, to the point where it even re-named itself after its most popular character, Archie. In the 1960s, the genre was popular again. Practically all of the old MLJ characters were brought back for a huge crowd scene in Mighty Crusaders #4 (April, 1966). The Fox turned up again in the next issue, along with The Web and Captain Flag, with whom he'd formed a new super-group called The Ultra-Men. That outfit was never seen again, but The Fox did turn up a couple of times over the next year or so, in the back pages of Mighty Comics. Since then, the company has made scant use of its superhero characters. When it does, The Fox is sometimes part of the mix, but never a very prominent one. Text ©2003-07 Donald D. Markstein. Art © Archie Comics.